Place your jars, lids, and rings in a medium saucepan, and cover with water. Bring to boil for 10 minutes to sterilize. Remove jars, rings, and lids with tongs, and place on a clean kitchen towel to cool and air dry. Meanwhile, cut the beans in half crosswise, and then lengthwise to expose seeds. Tuck the beans inside the respective jars and fill with one with vodka, and the other bourbon. Place lids and rings on jars and close tightly, shake them a few times, label, and place it in a cool, dark cabinet. Let them rest for 8 weeks, while occasionally shaking a couple times per week, which will become darker over time. 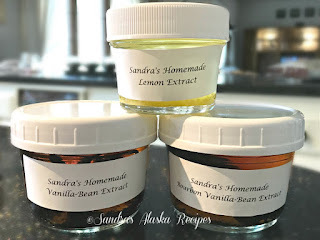 After 8 weeks you can start using your homemade extracts in recipes for custards, pies, tarts, breads, desserts, crepes, sauces, breakfast dishes, smoothies, and so on. If you would like some of the seeds in your recipe, just shake the jar beforehand. – Enjoy! Tips: Use as much as you need, and when you have only 20% of the extract remaining you should replenish them respectively with more vodka/bourbon, and shake again. In addition, when you're using a fresh vanilla/bourbon bean in a recipe, add the empty pod to the respective jar of homemade extract. If you continue to feed them in this manner, the extracts will keep forever; simply remove some of the older beans if the jars become too crowded. Empty vanilla or vanilla bourbon pods can be placed in sugar jars, or tea tins to flavor them as well. thrilled to my fingertips with this easy peasy way to flavor delights.